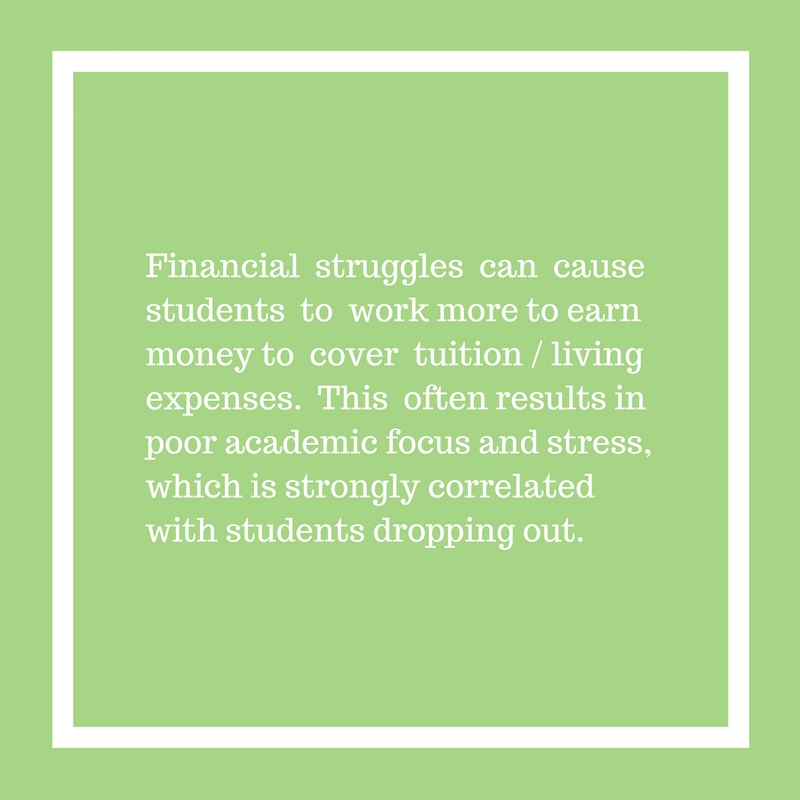 Financial trouble is a leading cause of dropouts among students, trumping academic struggles. Even if they excel academically, some students are leaving school from the pressure of increasing debt. Financial mismanagement and rising costs are making it difficult for students to afford college expenses. In fact, many schools cite financial reasons as the number one cause of student dropouts. Help your current students concentrate on learning instead of worrying about their finances by making financial education a part of your school’s retention program. Students will learn how to manage credit, reduce debt, create a budget, and prepare for the next phase of their lives. 2= Berman, Jillian. “America’s growing student-loan-debt crisis”. Market Watch. 2016. Web. 16 December 2016. “College is often the first time that young people make financial decisions on their own, including those about housing, discretionary spending, banking, and the use of consumer credit. These decisions and the habits that are developed not only affect students while in college, but have implications for their ability to repay student loans and begin building assets once they leave college. The decisions students make in college affect their financial situation even after they leave school. With financial reasons topping the list of why students drop out, students are struggling with their finances and colleges are struggling to keep them in school. Keep students focused on their education by teaching them to take charge of their finances through interactive, online financial education lessons. Strengthen Your University’s Commitment to Excellence! In addition to helping students and faculty, you can employ EDSA’s programs to deliver financial education to local businesses. Expand Your University's Community Outreach! Become a resource for local businesses by providing financial educational services. The university can offer the education, generating revenue for the school and bringing value-added service to the community. Empowering people with financial knowledge opens up fund-raising opportunities and helps your school show how much it cares. Enrich Your University's Current CFP® Curriculum! Supplement your school’s financial curriculum with EDSA’s programs. Implementing our workshops or online tool into the CFP curriculum will teach students how to communicate complicated financial subjects to their future clients. Students will also learn more about the structure and subject matter of a comprehensive financial plan. community outreach through adult education offerings, EDSA offers programs to suit your needs. Good Money Habits™ and Good Money Habits for Students™ combine EDSA’s proven curricula with the accessibility of the Internet. Our e-tools contain interactive lessons, reading and audio materials. Additionally, users are able to tailor their experience through selection of topics, definitions, and points of interest. EDSA can provide communication materials to promote helpful money tips and drive students to take advantage of the financial education offerings. We feel that each interaction is an opportunity to provide useful, actionable money tips to engage the audience. Want to learn more? Give us a call at (888) 760-3372, join us for a free webinar on our next available date, or contact us by email. We look forward to hearing from you!